Available in popular 15-, 16- and 17-inch sizes, the Classic III offers a high load rating for hauling, a greater number of fitments, and special 15x7 and 16x7 six-lug and eight-lug sizes for trailers and toy haulers. 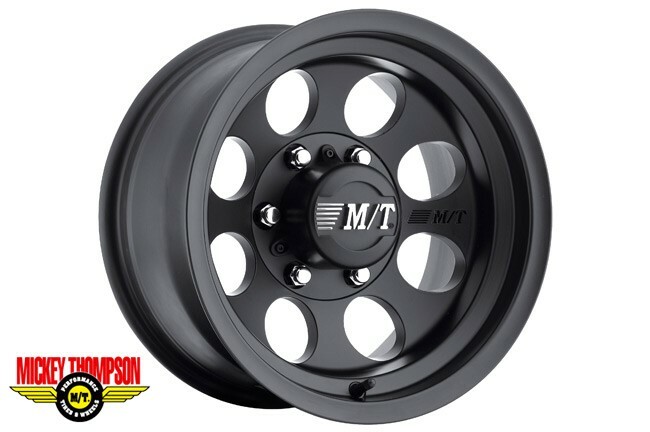 The wheel features a deeply embossed Mickey Thompson logo and also includes corrosion-resistant center cap with the Mickey Thompson logo. Features a satin black finish and protective clear coat. Smooth outer lip for a clean look. New 16 x 7, 6 lug and 8 lug trailer applications. Non corrosive, two-tone, screw-on center cap included. Lifetime limited warranty against structural defects. Open Caps are available for 5, 6 and 8 lug wheels. Sold separately.